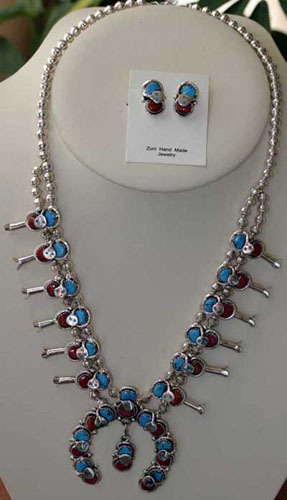 Zuni Native American Indian Squash Blossom Necklace and Earring Set. It is made from sterling silver, coral, and turquoise. The total length of the necklace is 21 1/2". It has 12 beautiful squashes on it. It is stamped Zuni and Effie C. The large center naja is 2 1/2" by 2 1/4". The earrings are 3/4" in length. This item comes with a certificate of authenticity.